Anthony and Benjamin Rucker where the sons of John and Susannah (Phillips) Rucker of Orange County Virginia. Benjamin born in 1726 became a lawyer, justice of the peace, a vestryman at St. Matthews Church, trustee of Warminster Academy, a member of the Amherst County Committee of Safety, and a Captain in the Revolutionary War. Anthony born in 1728 was also a Revolutionary War Captain, as well as Amherst’s Commissioner of Provision Law in 1781 and Tobacco Inspector in 1792. The Bateaus where used by the Continental Army. Bateaus were used to move troops, munitions and supplies on the shallow inland rivers during the Revolutionary War. They were carefully built craft as they were often mentioned as being built by a boat builder or “ship’s carpenter.” This evidence infers that the crafts known as “James River Bateaus” were strong, shallow-drafted vessels. They were a valuable military asset and were considered a major loss if captured by the enemy. These boats were used until around 1850. There is a James River Bateau Festival held every year in Lynchburg VA. 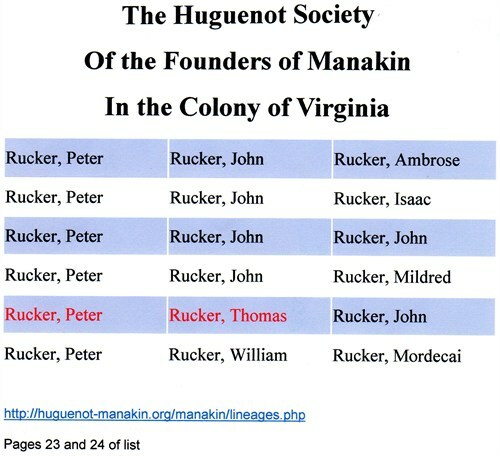 They celebrate the Rucker’s and their contribution to the early Transport for the tobacco industry and the Revolutionary War. They launch replica Bateaus and travel down the James River to Maiden’s Landing.